With this year’s Festival focusing on Youth, many activities are designed with children and young adults in mind. Join exciting games, listen to thrilling stories of falcons and salukis, take part in interactive workshops, and meet real falconers who will introduce you to birds and hunting dogs. In the Arabian Pavilion, don’t miss the chance to experience what it’s like to be a falconer! Learn from a professional how to handle a falcon, have it perch on your glove, explore different falconry equipment and learn how it is used. Find out how falconers track their lost birds using modern GPS telemetry. At the Arabian Pavilion, get close to beautiful falcons and learn where they come from, how they hunt, and how fast they can fly. Did you know that they each have a different personality? At the UAE Pavilion, meet saluki hunting dogs and enjoy the company of houbara bustard, the favourite hunting quarry of Arabian falconers. 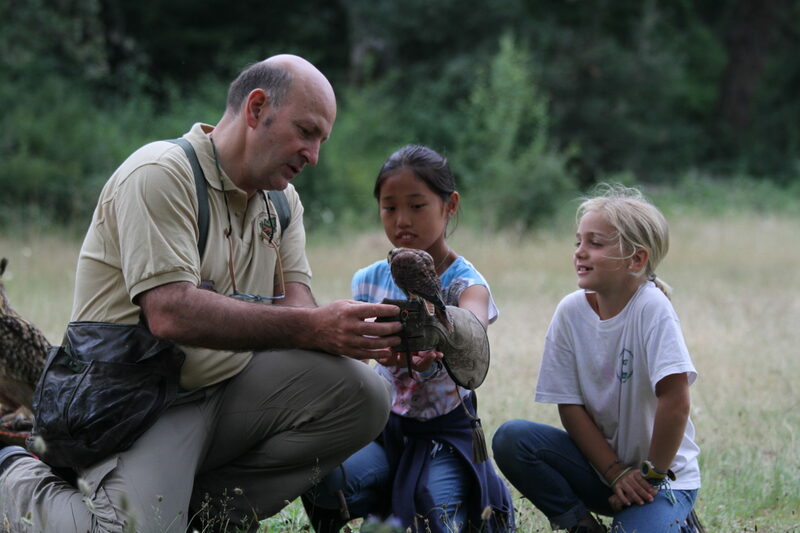 At the Children’s tent, learn about different types of raptors and the prey they eat through games and competitions. Follow the migration routes of saker falcons and houbara, and learn about bird anatomy. Get a falconer passport and use a treasure map to explore, getting your passport stamped as you visit the Falconry Nations tents. Free your creative side at falconry-inspired art workshops led by professional artists. Model birds of prey using clay; paint and draw; learn how to make origami falcons, and make a paper falcon hood. Learn about raptors’ digestive system by dissecting a pellet! Young adults can learn how artists decorate falconry equipment such as hood and bags. Enjoy thrilling and ancient stories about houbara, salukis and falcons from professional storytellers. In the Falconry Nations area, make friends with young falconers from around the world and learn about the special falconry schools they attend, the raptors and the different styles of falconry they practise. Learn about nomadic traditions from Central Asia while building a real Yurt! Take part in practical workshops suitable for all ages, on how to repair broken feathers, handle a falcon, track a lost bird, make your own transmitter and other falconry equipment, and much more. Learn how the ancient art of falconry lives alongside new technologies and training methods. Learn how falconers track their lost birds using radio transmitters and GPS systems. Every falconer has their preferred type of telemetry; learn the differences between them, and how technology helps falconers in their art. Make your own radio transmitter and see if you can fit it on a falcon! Falconers sometimes use remote-controlled lures, kites, balloons and drones to train raptors. This technology can help falcons get fit, but is also fun for the falconer! Come and watch the technique behind controlling a remote lure. It might look easy, but it takes a lot of practice! If you look around the festival area, you will see falcons wearing a special mask, called a hood. Come and learn why falconers use hoods, which hoods are used for different birds of prey, and how they are decorated. Watch hoods being made throughout the day and have a go at making one yourself. Falconers take great pride in having beautiful handmade equipment for their birds. Throughout the festival you will see falcons with stunning leather hoods that are sometimes decorated with intricate patterns and even jewels. Learn how to decorate a hood and other leather items from a professional leather artist. Have a go at making jesses, and maybe even a lure. Meet live houbara and saluki dogs, as you hear about the various state-led conservation and falconry heritage initiatives in the UAE. In a Bedouin tent, close your eyes and listen to Nabati poetry and let it take you on a journey to the heart of the desert and to its inhabitants and their lifestyle. Get close to saluki hunting dogs how they have hunted with Arab falconers for centuries, and their role as reliable hunting partners. Marvel at their beauty and get to know their individual characters. Encounter houbara bustard, the favoured quarry of Arabian falconers, while learning about their conservation by the International Fund for Houbara Conservation. Abu Dhabi has one of the only specialised hospitals for birds of prey in the world. Meet the amazing people who treat sick and injured falcons, often using falconry techniques in their work. The Abu Dhabi Falcon Hospital is a focal point for young avian vets, and each year students from all over the world compete for internships here. 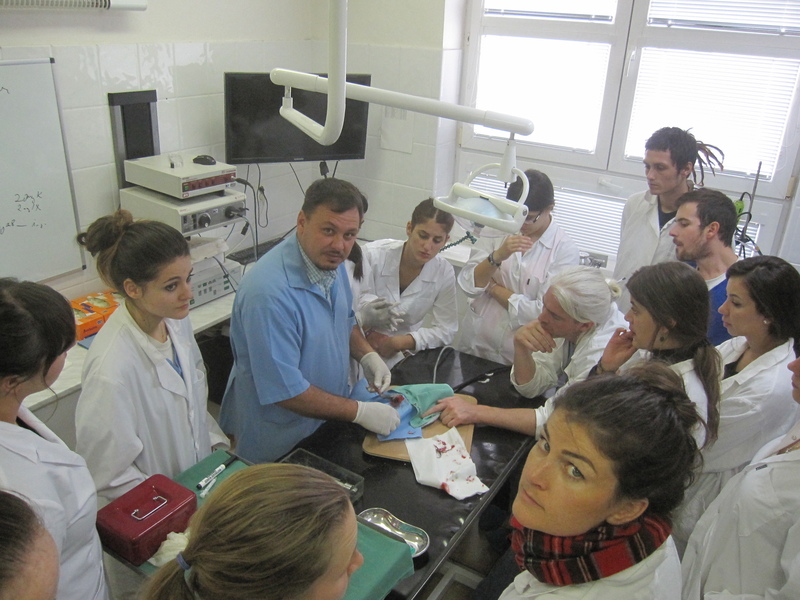 Have you ever thought of becoming an avian vet? Come and be inspired. Al Ain Zoo will have on display a selection or raptors from UAE and beyond. Here you can learn more about eagles and owls and how they fly and what they hunt. Will display an exhibition about history of falconry. Hundreds of falconers from over 80 countries will be coming together to celebrate and share knowledge, and learn about the traditions, techniques, and equipment used by their colleagues around the world. Festival visitors can discover a colourful, multicultural, and multilingual fair and meet young and old falconers in their national dress from all corners of the planet. Explore the Falconry Nations area and meet falconers from around the world in their traditional costumes. Meet those youths from Poland, Slovakia, Spain, South Africa, and Zimbabwe who they attend special falconry schools. Learn about the hawks, eagles and falcons they fly, how they take care of them, and the different equipment they use. The Festival highlights their unique heritage and celebrates their common passion: the art of falconry. Falconers from the Gulf region will be gathering in the Arabian Falconry Pavilion, where you can enjoy unparalleled hospitality, sample some delicious Arabic coffee, and relax in the company of falcons. Pay a visit to the Steppe Village with its yurts designed to withstand the strong winds of the Asian Steppe. Say hello to Kazakh and Mongolian falconers who hunt with golden eagles on horseback. Explore the equipment they use and let them tell you about falconry in their home country. Take part in the Yurt building competition! From North America, the Tipi Village brings a flavour of the Great Plains and its native cultures. Listen to the sounds of the grouse and run your fingers through the buffalo skin furs. Visit the Falconry Schools’ tents to learn how young apprentices in different countries attend specialised schools to receive education in the art of falconry, often as part of their everyday curriculum. Take a journey from falconry’s past and into the future. Learn about the achievements and future priorities of the growing international community of falconers and falconry organisations. Discover the role the UAE played in the UNESCO inscription of falconry as Intangible Cultural Heritage, and get an insight into the many ways falconers are involved in nature conservation. The International Association for Falconry and Conservation of Birds of Prey (IAF) is the global voice for falconry. The IAF unites 110 organisations in 86 countries. Drop by and see how the IAF has made a difference worldwide since 1968. IAF Young Falconers’ Group supports falconry amongst the youth by creating direct links between budding falconers all around the world, exchanging ideas and inspiring each other. Come and find out how they see future of falconry. The mission of the Women’s Working Group is to assist women falconers around the world through education, promotion, networking and mentoring, as we seek to practise falconry as a hunting tradition. We also document women’s role in the history of our art: many women have contributed to the history, methodology and community of falconry worldwide. The IAF’s Board and Advisory Committee includes women falconers, and there are women falconers serving as National Delegates in the IAF Council. The School Links Programme was established in 2010 as part of the Mongolian Artificial Nest Project, with the aim of ensuring the longevity of the 5000 artificial nests erected on the Mongolian Steppe. It now links students in 38 schools worldwide, in Austria, Bulgaria, Mongolia, the Netherlands, Norway, Portugal, Slovakia, and the UK, USA and UAE.Mongolian schools visit artificial nests near their homes and communicate with their international peers about falcon biology and conservation, and falconers visit classes with their hawks.Come and meet the team behind this amazing project. Maybe your school would like to join the programme, or perhaps you are a falconer who would like to take part? This exhibition will display a collection of photographs telling the story of the first World Conference on Falconry and Conservation, which took place in the UAE in 1976, and which became the 1st International Festival of Falconry. The exhibition is also a celebration of the UAE’s role in the UNESCO inscription, and will highlights the achievements and outcomes of this festival. This exhibit will highlight projects managed and initiated by falconers in the Middle East and around the world. Falconers have had an instrumental role in researching, monitoring, and restoring threatened populations of wild raptors. Here, in a Bedouin tent, young falconers can exchange ideas with other young falconers from around the world. The next generation of falconers is here to carry the falconry torch into the future. Watch the world go by, relaxing in the company of falcons and salukis. 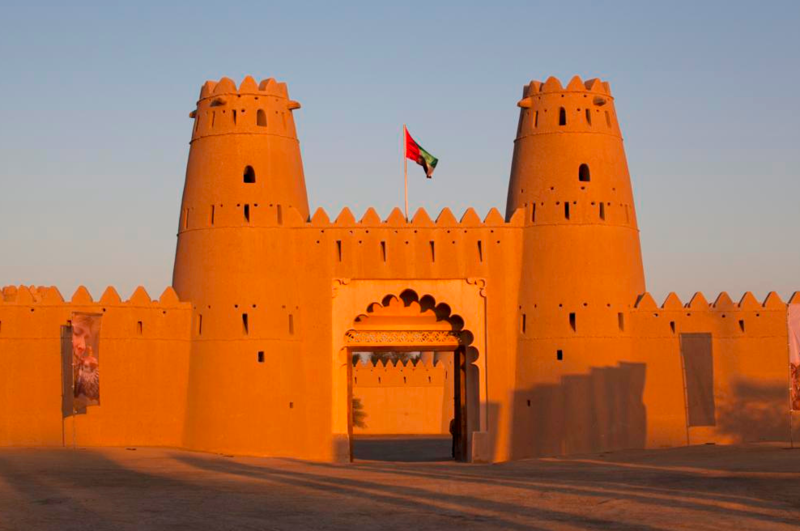 Experience the amazing hospitality of the falconers of the Gulf region, and hear their stories over an Arabic coffee. Young visitors will enjoy exciting tales of the houbara. The weathering area hosts all the falcons of the Emirates Falconers’ Club. Here you can see the birds up close, learn about their personalities and lives, and watch them preen and relax. At first all falcons might look the same, but if you spend enough time watching them you will see the subtle differences in colour, size and shape. Can you tell which one is a peregrine and which one is a saker? What is the difference between males and females? And which birds do Arab falconers prefer? You may even have a falcon perch on your arm. Come and join falconers in a Bedouin tent and learn about Arab falconry as a desert way of life. Explore the beautiful handmade falconry equipment and learn how it is made and used. Listen to exciting stories about hunting and desert life. Lean about the Mohamed bin Zayed Desert and Physiognomy School – the first school in the world dedicated to teaching the principles and practice of Arabian falconry and promoting its cultural value for future generations. The School will hold several workshops and talks throughout the festival. Find out how to be a falconer and learn about falconry heritage in the UAE. International Falconry Schools from Zimbabwe, South Africa, Spain, Poland and Slovakia will hold workshops and talks throughout the two day Festival. 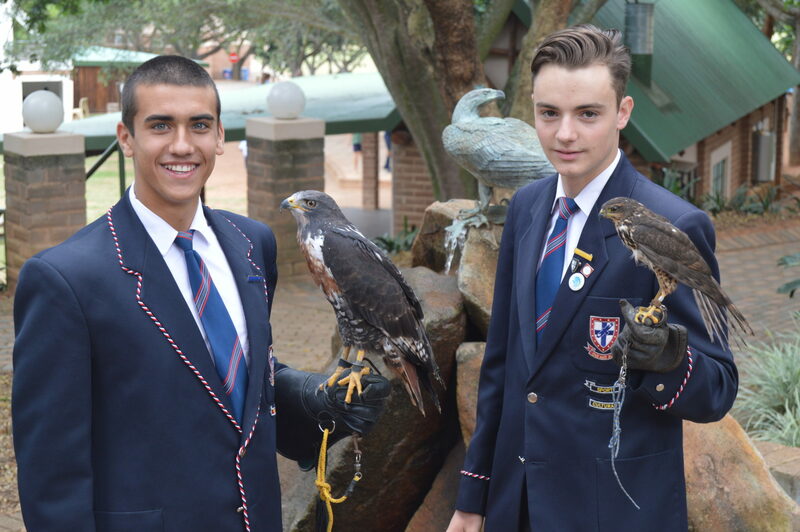 Evan Wellock, David Mann, Patrick van Wyk, Michael Learmonth, Christopher Hayes and Brandon Godfrey from Falcon College will talk about Hawking in Africa. 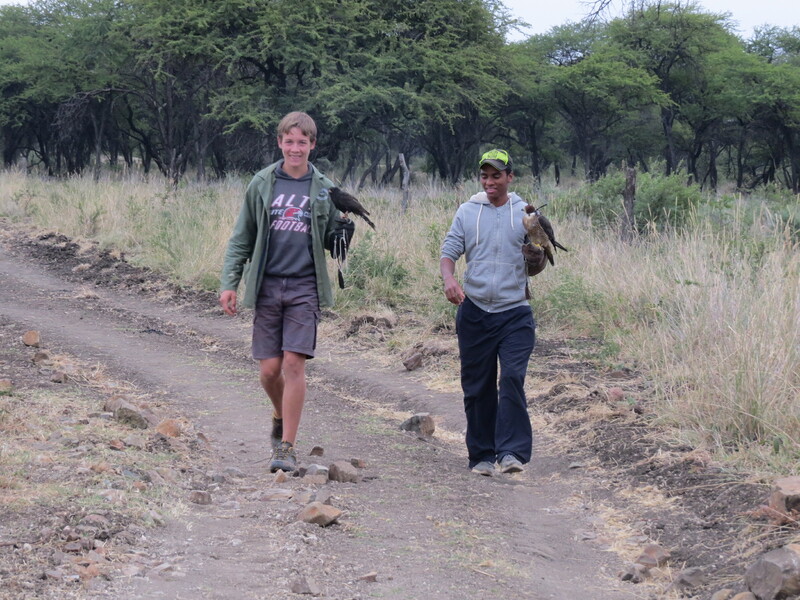 Join Falcon College to hear how our young falconers hunt in the African bush with their indigenous birds of prey, and listen to some of the interesting encounters they have had with wildlife while hawking. Dr. Javier Ceballos and Lucía Borque will talk about the Camp, come and learn about how to join it!